Microsoft is currently working on finalizing Windows 10 Redstone 5 (possibly called October 2018 Update), and since the focus is no longer on new features, more refinements make their way to the latest preview builds. 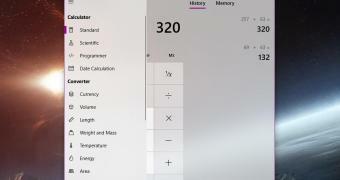 One such refinement can be found in the Calculator app, which has received some silent updates in the most recent Insider release in both the Fast and the Skip Ahead rings. The Windows 10 Calculator now features an improved hamburger menu which features icons for each option for a design that makes much more sense and is a lot more intuitive. This is an approach that Microsoft has used for the Settings menu of Microsoft Edge browser as well, as the original design featured no icons but was later updated for a more compact look.